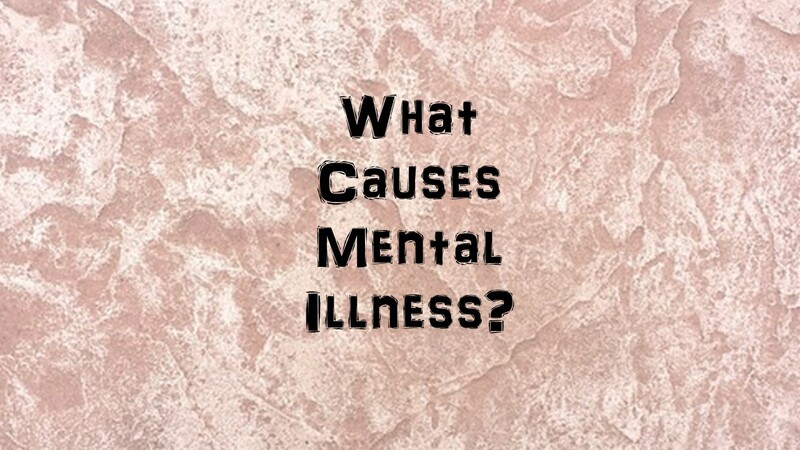 What really causes Mental illness? Why do some people get a mental illness and not others? We have had a lot of theories of mental illness, over the years, most of which have not panned out. So what do we know or think we know at this point? Some things that were suggested as causes of mental illness in the past turned out to be only a little right and a lot wrong. Check past posts for the discussion of that part if you missed it. Recent studies of the brain have added a lot to our knowledge of how the brain works and what is causing those processes. The picture while having more lines drawn in is far from clear. Some people would like to think most of what we call mental health issues are the result of something wrong with the brain. Other people will argue that mental illness is caused by a person’s thinking or life experiences. Let’s try to sort this out.I believe the truth is yes to all three possible causes. In some ways yes mental illness is a disease of the brain. But in other ways no, there is more to getting a mental illness than just something chemically wrong with the brain. We believe that mental illness is a real illness. The principle impairments are in the area of the nervous system. So this is not something the person chooses to have or can just snap out of. Mental illness is, I think more complicated than just that statement. Saying mental illness is a brain disease should not be taken to mean that the person was born with a defective brain. They are not subject to recall or reassignment because of some sort of human lemon law. Yes, some brains are born different, right from the start. Unfortunately thinking that abnormalities in the brain are the one and only cause of mental illness is way too simplistic. Let’s look at how the brain works, in a grossly oversimplified way, by comparing it to something most of us use every day. How is your brain like a car? You call the mechanic and tell him your car is not running, it no-goes. He tells you to bring it in. You get it towed into the garage. The mechanic checks it, you’re right, it does not start. He tells you it is a lemon, worthless car, get a new one. Wait a second, you drove this care in the past, it went then, why not now? The analogy here is why does someone seem normal at 12 and at 20 hear voices? Was there a brain bad all that time? Or did something change? How come someone who used to be happy gets depressed? Bad brain? I do not think so. So the mechanic notices your tires are low, puts air in them, still, the car no-goes. You check for gas, fill up the tank, but the car still does not run. With people, we do all the stuff that is supposed to make them stop being sad, but they still are depressed. So the mechanic changes the battery, then the starter, finally the engine turns over. You get in the car and put her in gear and – the car goes nowhere. It still no-goes. Down the line, you find that there is somewhere in the transmission and it slips or the rear end or drive shaft is bad. It could be lots of things. Point is that the car has lots of parts – So does your brain. So your brain has lots of parts and problems in one part may look sort of like problems in another part. Genetics may affect the structure or the functioning of various parts of your brain. To date, we have identified over one hundred genetic mutations that appear to contribute to schizophrenia. No one mutation explains it and you can have varying amounts of these genes and still not get it. Take these 100 genetic mutations that may relate to schizophrenia and multiply that by 400 to 800 other mental health conditions and you see where this could go. This is not, 100 times 400 by the way, but 100 times 399, times 398, and so on. One of you math guys can run the numbers if you want but you can see this is a HUGE number. So a portion of the brain the works too fast, too slow, is too large or small or has wires connected incorrectly. This can all increase the risks that your brain will give results that are different from the results others get. This may mean a mental illness or it could mean creativity or novel abilities. Sometimes the symptoms we call a mental illness can be connected to something else we call a talent. All very confusing. Some of these personal differences, like fast thinking speed, may have been adaptive when your ancestors lived in the jungle and had to run from tigers but can get you in trouble if you jump to conclusions and hit someone who was just joking with you. Notice that, to belabor this analogy, fluids do not work the same way in all parts of your car. Water is good in the radiator but may be bad if it is in your electrical system or your oil. Same with your brain. Serotonin or Dopamine or other neurotransmitters may behave differently in various parts of the brain. So saying that the brain has too much or too little dopamine, may be wrong. Saying that there is too much or too little in a particular part of the brain might be closer to the truth but not there yet. Thoughts are moved from one nerve cell to another by chemicals we call neurotransmitters. Since thoughts are carried by chemicals, what you think changes your brain chemistry. That is a major factor behind the effectiveness of talk therapies. Experiences can change the wiring of the brain. And of course, genetics can affect the shape, size, and efficiency of any number of thousands of parts of the brain. So your genetics can predispose you to a particular mental illness, your environment can alter those neural circuits and your thoughts can add to or reduce the problems. No one thing is the whole answer but cumulatively they add up to a lot of ways the brain can be different in one way or another. Some of these differences we define as good and some we call mental illnesses. Someone who has parents with a particular “high risk” gene who is under stress as a child, say abuse or neglect, or who does drugs or has tragedies in their life, all those things can add up to more than this particular brain can handle. There is no one thing that causes all cars to no go. There is also no one thing that causes the conditions that we are calling mental, emotional and behavioral illness. Genetics, at birth and as the genes express themselves across the lifespan, coupled with life experiences and learning and add in beliefs about things or attitude and all together in varying amounts may be the cause of what we are calling mental illness. Next stop, after few other things get talked about, coming soon – What is complex trauma and how does it rewire the brain? This entry was posted in Mental Health and tagged Counseling, Depression, emotions feelings, Mental Health, Mental illness, self-esteem, Success and Failure, Therapy by David Joel Miller. Bookmark the permalink.